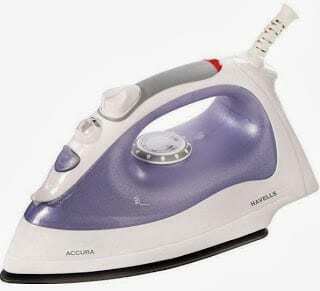 Steam irons remove wrinkles from your clothe faster and easier. Overall, they perform better than dry irons. The secret to their performance is Steam, which moistens the clothe making it easy to iron. Steam iron prices in Nigeria ranges from 1,400 to 52,000 Naira depending on your location and the level of sophistication of the iron. The cheaper steam irons are basic in nature with very few options while the more expensive models come with more features for ease of use and better ironing quality. The ultimate steam irons are the steam station irons which come with a separate unit as water reservoir making the iron lighter and easier to use. Steam station irons also offer a more professional result. Some of the popular pressing iron brands to checkout are Philips, Panasonic, Tefal, Rosell Hobbs, Rowenta, Kenwood, and Binatone.